vi+486 p., cloth, 1070 g.
This volume is the first to be devoted specifically to the study of lexical semantics in Ancient Egyptian. While much research has been dedicated to a wide range of grammatical issues in past decades, lexical semantics has rarely been treated in a systematic fashion. The papers collected here treat a range of semantic phenomena, from the lexical semantics of spatial expressions, to the problems of analyzing polyfunctionality and even to the semantics of the Egyptian writing system. The scope of these issues goes well beyond the individual ‘word’ or lexical item, as a number of papers address the semantics of syntactic constructions. Some authors call into question the distinction between lexicon and grammar, or analyze the lexical semantics of items usually considered ‘grammatical’ or ‘function’ words, such as discourse particles. This volume also spans a number of theoretical frameworks and methodologies that have not been prominent in Egyptian linguistics and philology, such as typologically-oriented semantic maps and other visual tools. 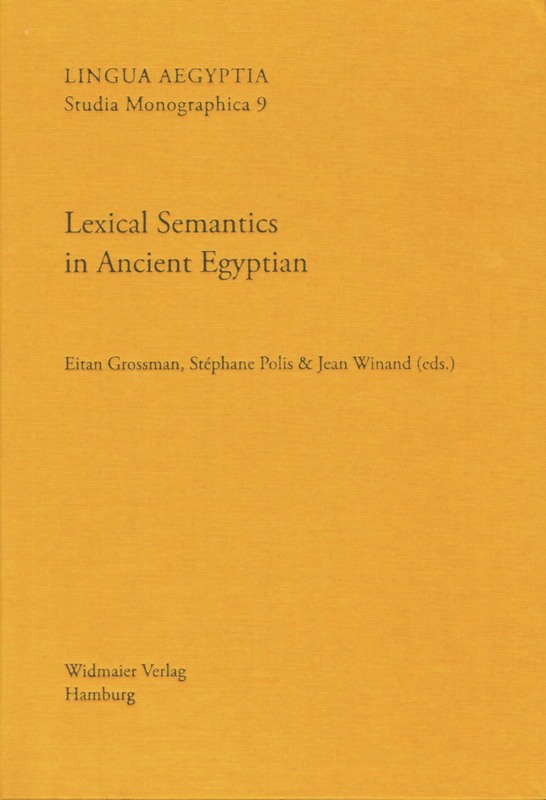 The papers in this volume do not aim to define the ‘state of the art,’ but rather seek to stimulate the study of meaning in Ancient Egyptian, to point to innovative avenues for future research, and to engage in a broader dialogue between Egyptian linguistics and philology, on the one hand, and the research frameworks and agendas of general linguistics, on the other. What are “Determinatives” good for? This article attempts to answer the question: why did the Egyptian script keep a cumbersome and, in principle, unnecessary system of multi-determinatives for more than 3000 years? Almost every word in the script is followed by a few additional “mute” hieroglyphs (hieroglyphs that are not to be pronounced) that provided additional information about the word. As the Egyptian script is first and foremost a communication system, the question to be raised is: what are the “gains” brought by the use of these determinatives into this system that contributed to their retention and extensive usage for thousands of years on the “communication market.” We contend that the conservative answers given in Egyptology are insufficient. The answers to these questions can be found through redefining “determinatives” as “classifiers” that operate as a “classifier system” analogous to such systems in oral languages. Moreover, being of a different medium — script and not speech — the Egyptian multiclassifier word offers the reader a rich array of additional data, unavailable even to other classifier languages. This paper is concerned with the semantics of Egyptian classifiers, their relation to the lexicon, rules of their assignment, as well as the structure of categories marked by a classifier, and classifier variation in Egyptian. We will discuss lexical origin and iconicity as sources for classifier meaning as well as retroactive effects of the category on the meaning of its classifier. We will explore reasons for heterogeneous category structures with the help of a prototype model. It will be demonstrated that classifier categories do not exactly correspond to lexical categories as marked by hyperonyms or to covert taxonomic categories. Furthermore, certain types of classifier variation will be analysed: One type of classifier is assigned according to lexical semantic qualities of its host (lexical classifier). The other type refers to its host’s referent in discourse (referent classifier) and is sensitive to pragmatic factors. The steps put forward in our paper for the analysis of classifier semantics and classifier-host relations account for a number of variation phenomena that hitherto have caused some Egyptologists to reject a classifier approach to the Egyptian material. In Spoken Egyptian, the form of a linguistic sign is restricted by rules of root structure and consonant compatibility as well as word-formation patterns. Hieroglyphic Egyptian, however, displays additional principles of sign formation. Iconicity is one of the crucial features of a part of its sign inventory. In this article, hieroglyphic iconicity will be investigated by means of a preliminary comparative typology originally developed for German Sign Language (Kutscher 2010). We argue that patterns found in Egyptian hieroglyphic sign formation are systematically comparable to patterns of German Sign Language (DGS). These patterns determine what types of lexical meaning can be inferred from iconic linguistic signs. Two case studies are presented to illustrate the usefulness of cognitive linguistic approaches to lexical semantics in ancient Egyptian. The first case study concerns the polysemous verb fX, “release” etc. in Earlier Egyptian. Making use of cognitive linguistic notions such as image schemata and radial category structure, it is argued that the conceptual category of the verb is organized around a central prototype derived from the embodied experience of letting go of an object held in the hand. From this prototype the verb meaning is expanded by image-schematic variation and metaphorical extension to account in a principled way for all of the attested meanings of the verb. The second case study illustrates the notions of conceptual metaphor and cultural models by examining various metaphorical expressions of speech and thought based on the basic notion of the human body as a container for thoughts and words. On the basis of conceptual metaphor theory, it is argued that analyses of lexical semantics can fruitfully be complemented by studies on a much more general level than that of the individual lexical item. This case study argues that the various individual metaphorical expressions of speech, communication and understanding can be brought together in a cultural model representing one important way in which the Egyptians understood and talked about verbal discourse. In lexical semantic descriptions of Ancient Egyptian, there is a tendency to search for a single basic meaning or Grundbedeutung, even if the element in question has a wide range of meanings or functions. The actual functions of these elements — as they occur in texts — are usually explained as contextual or combinatory, derived from the interaction of the basic meaning with environmental cues or triggers. While there are certainly lexical items for which this is appropriate, there are nonetheless other ways of describing polyfunctionality, a generic term for situations in which multiple functions (or meanings or senses) are associated with a single signifier. The goal of the present article is to demonstrate that other kinds of analyses are possible, and can be equally interesting and useful for describing the facts of Ancient Egyptian and for relating them to cross-linguistic research. Moreover we show that Ancient Egyptian linguistic data allow us to test — corroborate, extend, or revise — hypotheses that have been proposed in the typological literature. The paper is structured as follows: Part 1 raises the problem of polyfunctionality and possible approaches to this pervasive linguistic phenomenon; Part 2 presents the (classical) semantic map model developed by typologists in order to account for the cross-linguistically recurrent relationships between two or more meanings of single linguistic forms; Part 3 examines the applicability and usefulness of this model in Ancient Egyptian with two small-scale case studies dealing with specific semantic areas ([a] instrument-companion and [b] allative). In each case, the semantic map provides a principled method for the analysis of polyfunctionality in both synchrony and diachrony. Discourse markers between grammar and lexicon. Two Ancient Egyptian cases for (de)grammaticalization? The diachrony of Ancient Egyptian allows us to study the emergence of a few discourse markers. Two case studies show an evolution that traditional grammaticalization approaches would term counterdirectional. They also illustrate the role played by formal analogy together with pragmatic inference in shaping specific outcomes of change. A model for describing the semantics of discourse markers is proposed, which can account for their polysemy in terms of an underspecified lexical core meaning and contextual parameters. Their characteristic function is seen as relating a discourse segment with some point of reference. The variation of the latter, especially its explicit or implicit character, results in different uses that are typical for such markers. The impact of the proposed approach on a grammaticalization analysis of discourse markers is briefly evaluated. This study compares and contrasts the form and function of the spatio-temporal expressions formed with the noun H#-t ‘front’ — m_H#t, r_H#t and xr_H#t — in order to see firstly if they change in usage over time and secondly to seek out the basis of any change. Concerning the first question, a diachronic analysis of the distinct usage patterns of m_H#t, r_H#t and xr_H#t calls into question the extent to which we can unequivocally categorise these forms as compound prepositions and adverbs. Some of the H#t forms that establish spatial relations with fronted Grounds could instead be classified as prepositional phrases comprising the relational noun H#-t ‘front’ plus the simple prepositions m, r and xr. Nevertheless, from the Old Kingdom on, clear syntactic evidence exists for the use of these forms in more grammaticalised constructions as compound prepositions and adverbs. On the basis of this data, linguistic hypotheses about the developmental patterns of compound prepositions and adverbs (particularly Hopper & Traugott 1993) are tested. Changing function is then interrogated from cognitive and pragmatic perspectives, in order to interrogate the theory prevalent in linguistics and cognitive sciences that the description of time is based metaphorically on the description of space and that abstract meaning extends from temporal relations (Heine, Claudi & Hünnemeyer 1991). Although the H#t compounds establish a wide range of abstract relations during the late New Kingdom, abstractness is evident in particular constructions from amongst the earliest attestations of some of these forms. Semantic networks based on the uses of these forms are thus proposed and the role of metaphor in semantic change is evaluated. The article explores the static spatial meaning of basic prepositions in Hieroglyphic Ancient Egyptian, as compared to eight modern target languages. The tertium comparationis is the typological-linguistic tool of the Topological Relations Picture Series. The author identifies as the basic meanings of some Egyptian prepositions: m in and from; r attached, close_to, and to; Hr superior (i.e. vert_on + above) and at; and xr inferior (i.e. under + below); as well as m xnw inside and within, and in_the_middle; dp (trad. tp) head.loc, at_top, and ahead; Hr dp on_top and above. Further, he highlights the case of the conflation of the meanings behind and around in H#, as well as the phenomenon of a ‘Paradoxical Figure–Ground Reversal’ as exemplified by Egyptian wrrt m dp (lit. great_crown in head) ‘the Great Crown on the head’. Finally, the author suggests decomposing the dynamic meanings of prepositions as well as the dynamic meanings of verbs. He supports the analysis that, in contrast to e.g. English, in dynamic contexts, Egyptian prepositions often only encode the static source or goal configuration, but not the path proper. Sprachen benutzen unterschiedliche Referenzsysteme zum Ausdruck der räumlichen Verortung von Entitäten. Für das Ägyptische und Koptische lassen sich Anhaltspunkte für die Existenz eines intrinsischen neben einem relativen räumlichen Referenzsystem 􀂿nden. Untersucht wurde in erster Linie die Verortung von Entitäten als links respektive rechts von einem Bezugsobjekt. There is an Egyptian verb nms, attested especially in ritual contexts, which is generally understood to mean “to clothe, to swath in textile” (Wb. II, 269). The contention of this study is that the current understanding of the word is in need of revision and that it rather means “to wipe (clean)”. This shall be demonstrated by a close analysis of its contexts of use, especially from the Ritual of Embalming the Apis which, being a very technical text, gives the most instructive examples for establishing the actual meaning of the word. Some possible specific denotations of the root, leading to the entering of other verbs nms into the dictionaries, are discussed, as well as possible nominal derivations from the root. Dans cette contribution, nous présentons une étude de sémantique lexicale sur le verbe nw(#) « voir, regarder ». Nous chercherons à dresser un tableau diachronique des différentes significations de ce lemme, en tenant compte des constructions argumentales, de l’Aktionsart, de l’aspect et du contexte des attestations conservées. Cette étude est consacrée à une classe de verbes trivalents appelés « verbes réversibles » parce que les deuxième et troisième arguments semblent pouvoir permuter sans entrainer d’importants changements de sens. L’enquête porte plus particulièrement sur les verbes #Tp « charger » et (s)Swi « vider ». Deux grands types de constructions sont mis évidence suivant que le contenu est traité comme l’objet du verbe « charger X dans Y » ou de manière oblique dans un syntagme prépositionnel « charger Y de X ». Après un inventaire détaillé de la structure argumentale, on s’attache dans un premier temps à cerner les variations sémantiques avant d’étudier les conditions qui semblent favoriser le choix de la construction. Sont notamment examinés le degré de définition des arguments, leur position sur l’échelle d’animacité et l’aspect grammatical.